Protesters at the Guggenheim Museum in February dropped white slips of paper symbolizing OxyContin prescriptions. Last week the museum said it would no longer accept money from members of the family behind the drug. Credit The New York Times. The arts have always relied on donations. Even with earned income from ticket sales, class fees, café sales and gift shops, every theater, museum, music or dance organization around the world in some way needs patronage. In the U.S. these days most organizations seek some kind of 60/40 percent split, between contributed and earned income, maybe 70/30 or even 80/20 if a place offers more in arts education than in production or presentation. Without individual contributions (still the biggest source of support for the arts worldwide), we could never afford to offer such extraordinary programming in such world-class facilities. But since the early 20th century, more and more the idea of a single super rich patron – or a few wealthy patrons – contributing most of the money and therefore controlling the artistic vision – has changed to a more democratic vision of many people supporting the arts in smaller amounts and thereby giving the organization more independence to pursue its mission and do its work, without worrying about the temperament of deeper pockets. And yet still, there are many organizations worldwide that because of their large budget and expensive facilities – and ambitious programming – need multi-millionaires in their corners – and families who can give larger gifts in the millions without batting an eye, in order to build a new wing, a new theater, a new exhibit or arts education center. The Sackler family has been, for decades, one of those families, giving generously around the world, to the Guggenheim and the Metropolitan Museum, among others, in New York, to the Smithsonian in Washington, and to the Tate museums and the National Portrait Gallery in Britain. The family’s sale of OxyContin, as the owners of Purdue Pharma, has always troubled some in the arts world who have benefited so much from money that could be generously called “tainted” by the fact that over 200,000 have died in the U.S. alone from addiction to OxyContin. But in January, as it was revealed that there was documented proof that family members not only turned a blind eye but also actively pushed the sale of OxyContin for greater profits, arts organizations were faced with a direct moral quandary: as organizations dedicated to the greater good, could they still accept gifts from the Sacklers, now knowing what we know about where it came from and how much suffering it had cost? And could they survive the PR disaster that could now come from having the name “Sackler” prominently displayed across their museum, theater, music hall or dance studio? 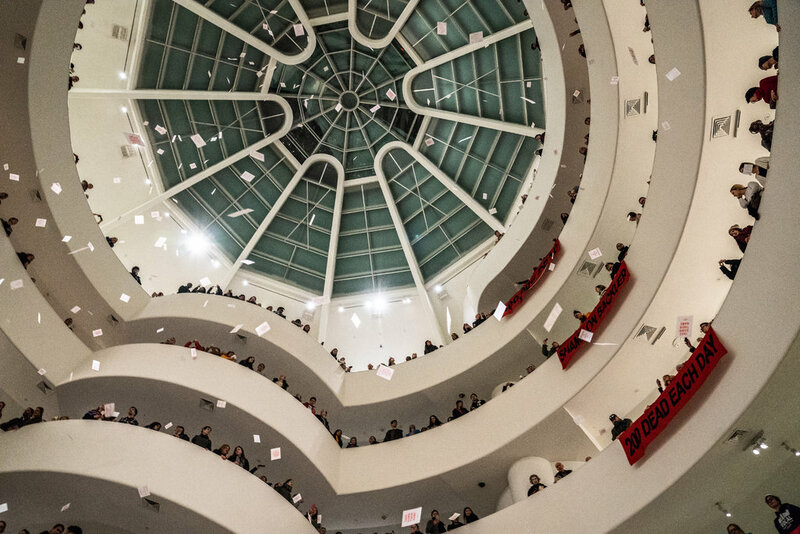 On top of this, active protests started to happen at places like the Guggenheim, with showers of prescriptions blanketing the museum from protesters pointing out the hypocrisy of a museum that may be living on the suffering of others. Finally, on March 25, The New York Times reported that several organizations, led by British organizations, including the Tate museums and the National Portrait Gallery, and followed by the Guggenheim, had announced they would no longer be accepting gifts from the Sackler family. As the piece points out, the British arts organizations acted more quickly and decisively to enact this new policy. And those in the U.S., where OxyContin has had a much larger impact, are being slower to take a firm stance. It’s good for these organizations, for both their images, their other fundraising concerns, and their missions, to be reacting in the right way to what now seems like some horrible choices by the Sacklers, even though these organizations will be turning away millions in donations. All of us in the arts need to be able to look ourselves in the mirror and be proud of not only what we’re doing in the world, but also of who’s helping us do it. Given the fact that we’re supposed to be dedicated to the greater good, it’s always better to avoid those who worry most about the good of their own bottom line.